Sometimes he accompanied her on her errands in the city, where everything had to be carried out in the utmost hurry. Then she would almost run to the next subway station, Karl with her bag in his hand, the journey went by in a flash, as if the train were being carried away without any resistance, already they were getting off, clattering up the stairs instead of waiting for the elevator that was too slow for them, the large squares from which the streets flowed out in a starburst emerged and brought a tumult of streamed lines of traffic from all sides, but Karl and Therese hurried, tightly together, to the different offices, cleaners, warehouses and stores which weren’t easy to contact by telephone in order to make orders or complaints, generally trivial things. – Kafka, Amerika, Hofman trans. 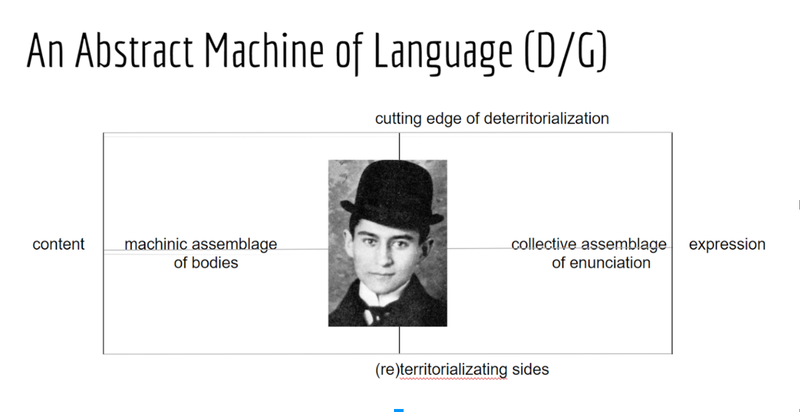 “No one is better than Kafka at differentiating the two axes of the assemblage and making them function together,” say Deleuze and Guattari, and though they are referring to the Czech writer, it applies quite well to the open source distributed message queue too, even though the quote was written thirty years before its invention. Kafka in either form effects both decoupling of components and a disintegration of content. Models, formats and codes are first broken down, then made available to be reassembled in other ways. I admit that when I first heard of it, naming an information processing system after a writer famous for depictions of absurd, violent and impenetrable bureaucracy did strike me as bold. It evokes The Departure (Der Aufbruch) as router documentation, or An Imperial Message (Eine kaiserliche Botschaft) as a Service Level Agreement. Perhaps we can think of the system developers as finally addressing Franz’s eloquent, frustrated, bug reports. 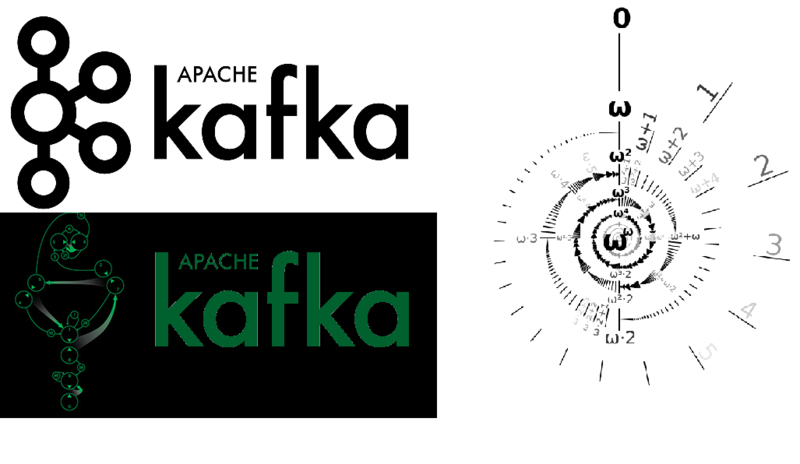 Jay Kreps, the namer of Apache Kafka and one of the co-creators (with Narkhede and Rao), simply explains that he wanted his high performance message queue to be good at writing, so he named it after a favourite prolific writer. Fortunately complete publication and reading doesn’t also require the process dying of tuberculosis, followed by a decades-long legal case. Even if Kreps did have a deeper correspondence in mind, if I were forced to explain the name all the time, I might just smile and point at my Franz fridge magnet too. The D/G quote is from the Postulates of Linguistics chapter, concerned with the way meaning is imposed on communicating agents and their intertwining systems. On a first, horizontal, axis, an assemblage comprises two segments, one of content, one of expression. On the one hand it is a machinic assemblage of bodies, of actions and passions, an intermingling of bodies reacting to one another; on the other hand it is a collective assemblage of enunciation, of acts and statements, of incorporeal transformations attributed to bodies. Then on a vertical axis, the assemblage has both territorial sides, or reterritorialized sides, which stabilize it, and cutting edges of deterritorialization, which carry it away. No one is better than Kafka at differentiating the two axes of the assemblage and making them function together. Deleuze and Guattari are secret pomo management consultants at heart, and as their dutiful intern I have accordingly expressed the great men’s vision as an Ansoff Matrix slide for distribution to valued stakeholders. For middleware, what D/G call the cutting edges of deterritorialization, we might call a payload codec. The data structure used within the producing process is disassembled, scrambled into a bucket of bytes, then carried away along a line of flight – in this case a Kafka topic. 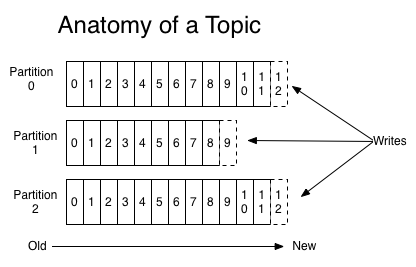 A Kafka topic is a transactional log, a persistent multi-reader queue where the removal policy is decoupled from reader delivery, and retention is instead controlled by time or storage space windows. (Blockchains are public transaction logs optimised for distributed consensus and no retention limit. Hence their inherent parliamentary slowness.) The consumer then uses its own codec to reterritorialize the data – making it intelligible according to its own data model, and within its own process boundary. Though nowadays the class signature of the messages may match (say both sides use the JVM and import the definition from the same library), at a bare minimum the relationship of those messages to other objects and functions within the process differs. No one is better than Kafka at differentiating the two axes of the assemblage and making them function together. On the one hand, the ship-machine, the hotel-machine, the circus-machine, the castle-machine, the court-machine, each with its own intermingled pieces, gears, processes, and bodies contained in one another or bursting out of containment (see the head bursting through the roof). On the other hand, the regime of signs or of enunciation: each regime with its incorporeal transformation, acts, death sentences and judgements, proceedings, “law”. […] On the second axis, what is compared or combined of the two aspects, what always inserts one into the other, are the sequenced or conjugated degrees of deterritorialization, and the operations of reterritorialization that stabilize the aggregate at a given moment. K., the K.-function, designates the line of flight or deterritorialization that carries away all of the assemblages but also undergoes all kinds of reterritorializations and redundancies – redundancies of childhood, village life, bureaucracy, etc. – Deleuze and Guattari, ATP ibid. Cataloguing these correspondences between D/G’s description of Kafka and the software that bears his name is not intended to ignore that their contact is a kind of iconographic car accident. Kafka is a famous, compelling writer, and frequent cultural reference point, after all. The collision of names reveals structural similarities that are usually hidden. In the Kreps talk above, titled in Deleuzian fashion “Apache Kafka and the Next 700 Stream Processing Systems”, he also introduces a stream processing API to unify the treatment of streams and tables. The team saw this as crucial to Kafka’s identity as a streaming platform rather than just a queue, and delayed calling Kafka 1.0 for years, until this component was ready. Nomadic messages escape through the smooth stream space, before capture and transformation in striated tablespace as rows in data warehouses. This unification of batches and streams echoes a similar call in computational theory by Eberbach. Turing computation is built around batches. Data is available in complete form at input on the Turing machine tape, then the program runs, and if it terminates, a complete output is available on the same tape. The theory of computability and complexity are built around this same encapsulated box of space and time. Much of what computers do in 2018 is actually continual computation – the reacting to events or processing streams of data that have no semantically tied termination point. That is, though the process may terminate, that isn’t particularly relevant to any analysis of computational complexity or performance we want to do. When editing a document on a computer, you care about the responsiveness keystroke to keystroke, not the entire time editing the document as if it were one giant text batch. By contrast, modern computing systems process infinite streams of dynamically generated input requests. They are expected to continue computing indefinitely without halting. 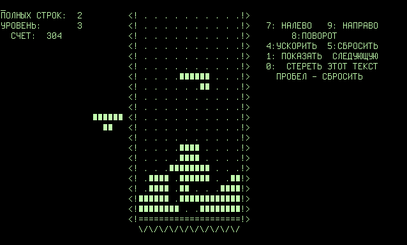 Finally, their behavior is history-dependent, with the output determined both by the current input and the system’s computation history. Streams are a computational model of continuation, and therefore infinity. In their wide-ranging 2004 paper, Eberbach and friends go on to argue for models of Super-Turing computation. This includes alternative theoretical models such as the π-calculus and the $-calculus, new programming languages, and hardware architectures. We conjecture that a single computer based on a parallel architecture is the wrong approach altogether. The emerging field of network computing, where many autonomous small processes (or sensors) form a self-configured network that acts as a single distributed computing entity, has the promise of delivering what earlier supercomputers could not. – Eberbach et al, ibid. These systems are now coming into existence. Through co-ordination with distributed registries (Zookeeper here), and with the improved deployment and configuration baseline devops techs have brought in, spinning up new nodes or failing over existing nodes is autonomously self-configured. Complete autonomy isn’t there, but it seems a high and not particularly desirable bar for many systems. 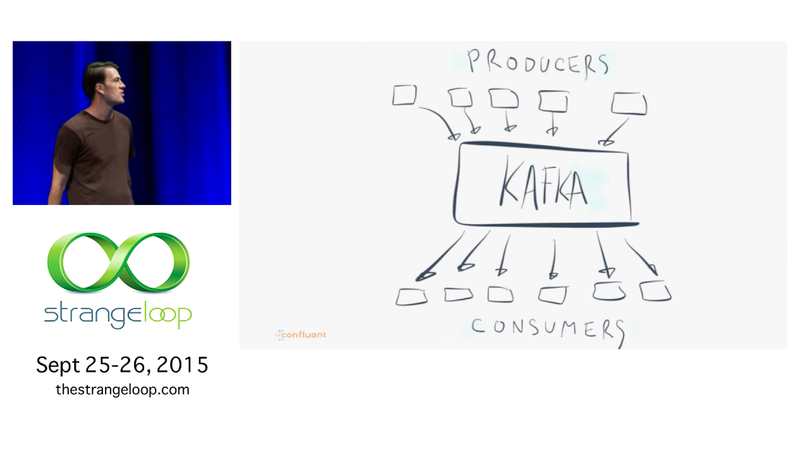 Distributed systems and streams predate Apache Kafka, nor shall it be the last one. Yet is marks a moment where separate solutions for managing streams, tables and failover are concretized in a single technical object, a toolbox for the streaming infrastructure of infinity. Loyalty cards are loyalty simulators. The corporate entity wishes to retain your business, so it assesses your service to it quantitatively. The class, or achieved level in the loyalty system, triggers a specific script in workers for the corporation. Loyalty is an animal feeling, for people and dogs. If we think of a corporation as a rule driven machine, that does not have emotions or emotional understanding itself, or at least something that is not an animal, we can see why the loyalty must be simulated. From the corporation’s perspective, loyalty is something quantified for the advantage of the organization. In happy circumstances this is a symbiotic collaboration of profit gained for services rendered, though the relationship can be parasitic too, with the corporation exploiting its customers, or customers exploiting loopholes in a poorly designed loyalty system. Now many people in service roles work hard to genuinely help people out, and really do like to see people looked after. I’m not dismissing (or idealizing) that human connection. The two elements that distinguish a loyalty program as a simulator in a fairly precise sense are firstly the corporate authored script, and secondly the systematic tracking of loyalty state (microsocial class), which in turn determines the roles of actors in the script. Humans write the scripts, and then different humans play them out. We go along as workers and customers with the script because it is our job and because it is convenient, or pleasant. In working with the script it’s hard not to have some emotional response, however attenuated, and loyalty simulation becomes loyalty stimulation. (Perhaps your formidable willpower, dear reader, means you never respond emotionally to corporate transactions, and have never cursed at a late charge on a phone bill, but I certainly have.) At this point we grant the corporation some agency, and it is simulating loyalty in much the way the AI in a Turing Test simulates intelligence. You can expand this viewpoint to encompass a whole worldview of corporate simulation, as in Baudrillard’s descriptions of Disneyland, “capturing all the real world to integrate it into its synthetic universe”. If we focus instead on the script, the actors, and the tracking of state, we can see loyalty programs as early adopters of gamification. Airline gold class status is the original level treadmill. The scripts of greeting are little interactive fictions, choose-your-own corporate adventures. Humans write the scripts and different humans act the roles. Help desk scripts run the same way: once you exit the robot-driven entry point (press 2 to choose Mandarin, etc), a customer simply enters another script with first level support, where, initially, your lines and choices are still very constrained. In the play Cyrano De Bergerac, Cyrano woos Roxanne by providing words to be delivered by another man with a more handsome face. The psychologist Stanley Milgram experimented with this idea, finding people reacted to people parrotting other’s words without suspecting they came from another. They gave people the benefit of the doubt that their thoughts were their own, which honestly is usually a good working rule, if you aren’t in a psychological experiment, or living in the twenty-first century. Milgram called the actors in his scenario cyranoids, after the play. It can seem a disturbing concept, as if controlled by another mind. But isn’t every first level help desk, every routine call centre call, every canned gold class greeting, a cyranoid scene? It is software using meat to impersonate meat. It is an inside out mechanical Turk, with the Turk on the outside and the machine within. Corporations and computing have really just made it cheap and banal. A military boot camp is full of cyranoid experience, of ritual interaction backed by systematic tracking. Or the political state itself, like the pre-modern state of special ranks, official clothing and carefully graded formal titles. We can be loyal to a state. We can be cyranoids going over the tops of trenches in our thousands, following a script written by someone else who lived before we were born. These pre-Turing simulators are nuanced and complex but computationally crude. It’s all IF-THEN, central storage is tremendously expensive ink on paper and the bandwidth is a nightmare. The signal to noise is appalling and you constantly have to resort to hacks like having deserters shot. Though we are sometimes fooled by crude or sophisticated gamification, we often participate in it actively, as well. Many soldiers of the Great War were sincere volunteers, putting themselves forward for what they saw as a greater cause, or in defense of people dear to them. A mechanistic view of society, where everyone is a robot programmed by some ritual, is too much a caricature. The cyranoid is an everyday feature of formal social structures, ones people have been using for millennia. The new aspect is simply computational cheapness, so we can now have cyranoids in high fidelity loops, remote procedure calls and chains of responsibility. The script is still acted by a person, who chooses with each interaction whether to stay on script or to improvise and face the systematic consequences, or benefits, of such disruption. With the contemporary explosion of gamified systems, and every app and online marketer trying to quant a few extra percentage points out of our custom, we navigate in and out of cyranoid scripts, tacking and gybing based on advantages of the moment, from our own obligations to the structured rewards and compulsions of the systems we sail between. Cyranoid is too passive a term. We have made a society of cyranauts.